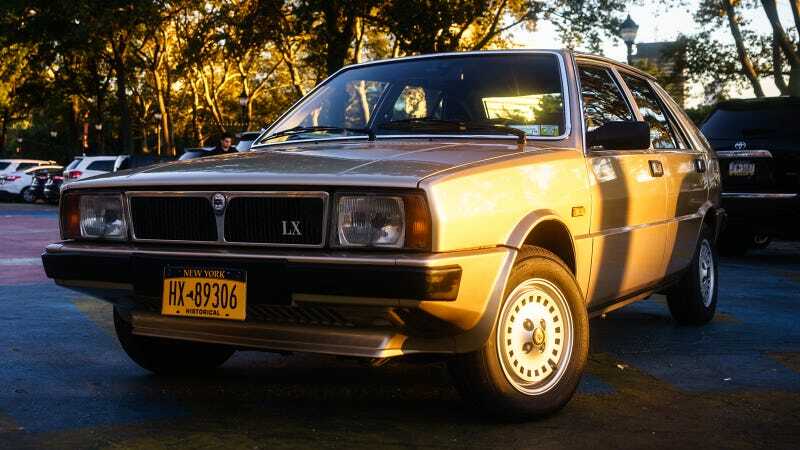 The 1982 Lancia Delta LX 1.5 is an upright box with austere angles and square headlights—entirely square, and gawky. “Designed by Giugiaro!” “Who?” Its Beige Chiaro Metallizzato is the same shade as a stomach virus. It was 1980’s European Car of the Year. It is a special little thing. This car could blend into any street in a period film of New York City when burnt Ford LTDs littered south Brooklyn. Today, it’s an inside joke, shrouded in anonymity to everyone who isn’t in on in. For those who know, however, it is a wink. Why is this thing special? Because it survived, that’s why. This humble five-door hatchback, with its 14-inch wheels and upright seating position and its driver’s side rearview mirror. Some family took delivery from Concessionaria Ferrari Pietro in Tuscany, opting for top LX spec, chrome trim and alloy wheels, beige wool seats upholstered by Zegna. They barely drove it. By 2004, this Delta LX had only racked up 16,000 miles. From then, it sat; in 2010, it was sold back to the son of the original dealer, who refurbished it, including a respray of its decidedly dated Beige Chiaro Metallizzato color. And eventually it wound up on the internet. Deltas are hot. But only a certain kind of Delta: the fire-breathing Integrales, homologation-special HF rally heroes, attention-grabbing auction luminaries immortalized in Martini stripes. The owner of this Delta couldn’t have scored it from Bring A Trailer for less than $3,000 if it was one of those. He reckons that in North America, the modest LX is even more obscure than an Integrale. Nonetheless, it is a hoot to drive—with a race-car motor that just loves to rev, jumping off every intersection with enthusiasm, its single-Weber carburetor and 85 horsepower; its jumpy little gas pedal the size of a pack of Davidoffs that sends the 1.5-liter engine into a high-revving frenzy. This particular Lancia Delta belongs to a Mark Skinner, who maintains an industrial brick-faced garage in Gowanus, Brooklyn. Skinner is an interior contractor by trade, designing high-end commercial spaces in New York. He has plans to curate his garage into a car club, of sorts, where enthusiasts can wax nostalgic under a Saab dealer sign and a disco ball. I had met him at the Lime Rock Historics, where he had brought the Lancia, a Rose Quartz Saab 900 Turbo, and a searing orange 1974 Saab 99 EMS for display. Naturally, we became friends. In October 2017, while taking a break from renovations, he found himself watching an online auction for a Delta, but not the one he wanted. He bid on a whim, and won. On Feb. 28, 2018, Skinner drove down to the Elizabeth Marine Terminal at Port Newark, New Jersey, and laid eyes on Francesca, his newfound nickname for the Delta in that gender-specific tradition. He got in and fired it right up. He drove around Newark sans plates, loaded it on a flatbed truck, and headed back to Gowanus. And that’s when the trouble began. Unsurprisingly, the DMV couldn’t make heads or tails of the documentation. Skinner enlisted an Italian friend into translating every single document. He got turned away. Twice. After the second time, “I hung around and tried to see who looked supervisory, managerial. There was an elderly woman who I beckoned, and who happened to be Italian descent, from Coney Island. I pleaded my case. I’ve done everything. I’ve paid extra. It’s all here. I won her over.” She bumped it up to Albany. By August, when the entire country of Italy usually goes on vacation, Skinner was able to wrangle from the seller the last of the documents. It took six months, but he finally sorted it out. “Am I hurting it?” Skinner asked. Skinner planned to showcase his Delta and a Rose Quartz Saab 900 Turbo at Radwood Philly. He needed a volunteer to drive one from Brooklyn an hour south to Philadelphia. For some reason, he entrusted me. Having sympathized with his anxieties, I put on an air of responsibility. I took the Delta around the block. Then, he bid me farewell as I headed toward New Jersey. In two days, he would drive down in the Saab. Quirks abounded. In typical severity that spawned in the ’70s and spilled into the ’80s, screaming The Future, the dashboard is made up of squares upon ubiquitous squares, resembling a sci-fi boombox. One of these square buttons tests whether the gauge lights work; every time I pressed it the instruments lit up like a discotheque. There is a countdown timer set into the headliner above the rearview mirror whose ominous red digits could, presumably, tell the exact time of my death. The glovebox has a mirror in it. The warning light in the gas gauge is an orange block as bright as a high-beam; it glowed every time I was on the clutch, or on the brake, or off the gas, or off the clutch, or back on the brake. Sometimes it flickered, but never when I was at speed. The door handles are delicate little metal hooks that swing upwards, which, according to Road & Track’s Chris Perkins is like “every Ferrari.” Having driven exactly zero Ferraris, I had to take his word for it. New Jersey Turnpike, 11 p.m., surrounded by people in hooptie slammed Infinitis, tailgating Range Rovers, and leering Peterbilts. The Delta reflected the most advanced thinking of the 1970s: fully-independent suspension, rack-and-pinion steering, five speeds in its gearbox, body-colored polyester-resin bumpers—everything we take for granted. The steering wheel, jump-rope-thin, controlled a large dead center, but it felt nimble at speed. Cruising at 75 miles per hour, the engine sitting at 3,800 RPM, pointing its rectilinear nose smoothly and solidly toward Philadelphia, it felt both crude and modern. I had lost all feeling in my pinky toe leaving Gowanus; blame the heavy, tall clutch which also squeaked constantly. Its transmission was a vague and brutish thing, with long throws that bury the shifter into the wool upholstery. The first gear synchros were on their way out. Dominic’s European Car had advised: either opt for a $2,000 rebuild, or throw in heavier gear oil. Grinding it at every intersection, sweating out every red light, starting from second after pleading for first wasn’t enough, I would have opted for the rebuild. Among friends like Perkins and Alex Hevesy, the Delta became our companion, a wagging dog of a car, with its charms and its health problems. From the closest Wawa’s we could find, to circling the Romanesque plaza around the Philadelphia Museum of Art, past Rittenhouse Square, past the Betsy Ross House and the novelty flag store across the street, and even up Interstate 95 that scythes the city up along the waterfront, the Delta fit in with the last vestiges of grittiness in these potholed city streets. Even Gritty would approve. I returned to Manhattan the next day. Coming through Staten Island, the world was enshrouded in rain and grey mist and limping bleating traffic: an ignominious way to return under the Verrazano Bridge’s dour arches. There had been nothing like triumphantly speeding across at night listening to disco, the skyline ablaze behind me; now, I was wrangling a podcast through my phone’s speakers. I parked in front of Skinner’s garage. Skinner has designs on a dealership, specializing in the cars that he’s interested in: “Having all this madness in my life, I’m thinking, maybe I should just follow my bliss,” he said. “I’m looking to specialize in the market that I love: the Eighties and the Nineties. Car companies still hired famous designers, and world-class engineers, and funded masterpieces of engineering.” Already the Rose Quartz 900 Turbo is up for grabs (just 83,000 miles!). And, maybe, the Lancia. Maybe Skinner is onto something. For the Delta, and Lancia in general, represents an art of lost Italian manufacturing: both solid and fragile at the same time, brimming with modernity and Old World charm. Nobody outside of Radwood gave it a second glance. It is secretly thrilling to drive, demanding a certain discipline from its driver. It survived the hell that is the Gowanus Expressway, both upper and lower decks, each with their own unique torments. Forget your Integrales, run-of-the-mill HF Turbos; future classics need not rotate around a handful of highfaluting icons. You may never get your Gullwing, or your Countach, or your 33 Stradale, and there’s no shame in that. The cheaper they are, the more accessible they can be, the more that new blood gets into the game. Radwood reflects that inclusiveness. So does a cheap little car that turns 37 this year, but you can drive the wheels off it.